Ralph Lauren’s new eyewear collection is inspired by Ralph Lauren’s love of vintage cars. 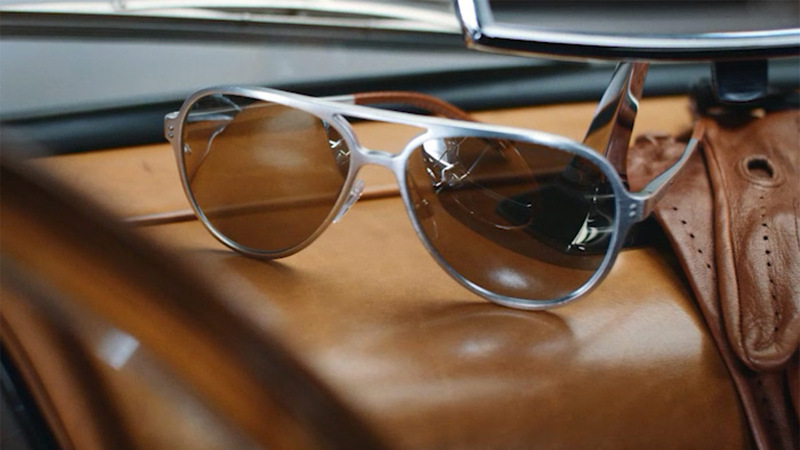 As aluminum has long been an integral component to the world’s best automobiles so that very material is the basis for Ralph Lauren’s Automotive Eyewear Collection. Composed of six new models – three sun and three optical – the lightness of aluminum is the distinctive feature of this collection in addition to the details of the end pieces that are reminiscent of the perforated leather used for driving gloves. On either side of the logo, two small screws replicate rivets, a detail of the bodywork of some of the most famous classic cars. The choice of materials is an indication not only of the great aesthetical refinement of the collection, but also of the important design and manufacturing process enhanced by the artisanal quality of every pair of eyeglasses. The talking piece of the collection, and one of the pictures in the advertising campaign, is unisex sunglasses model RL 7049Q, a pilot shape made from a single piece of aluminum, with vintage hinges connecting the front to the temples, also in aluminum, and sophisticated end pieces in perforated leather. This special piece is sold with a dedicated solid aluminum case enriched by a Ralph Lauren plaque flanked by vintage screws. The main model is joined by sunglasses for men (RL 8133Q), which have a square acetate frame and very lightweight temples in aluminum, and a pilot model for women (RL 7050Q), the perfect combination of aluminum and perforated leather details on the front. The prescription models for men and women are a combination of acetate fronts and very lightweight aluminum temples. All the models in this collection come in a special case in perforated leather. The glasses – ranging from $179 to $219, are now available at RalphLauren.com and in stores.